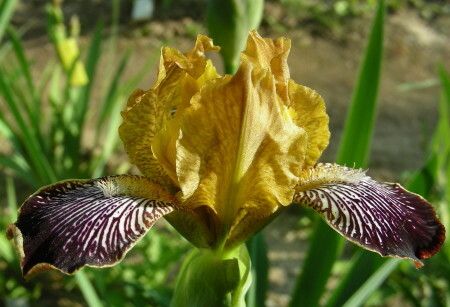 'Bessie Bell' (Loïc Tasquier, R. 2012) Seedling B266A. MTB, diploid, 26" (67 cm), Midseason bloom. Standards honey mustard with red-brown plicata, green median line, inside white, almost completely covered with honey-mustard plicata; style arms honey-mustard, red-brown infusion on crest; falls dark purple-brown, white stripes radiating ¾ down, thin yellow rim on the sides ending red at distal edge ; beards yellow in throat, tipped brown, thin white tipped yellow at ends. 'Fiesta Flirt' X 'High Master'. iris-26.com 2016. MTB: H473A, 'Anicroche', 'Batucada', 'Compère Guilleri', 'Ding Dong Bell, 'Lapsang Souchong', 'Minute Papillon'.